The expanded shell is the most versatile gimmick in all of coin magic. There are many published routines in books and magazines that use expanded shells. 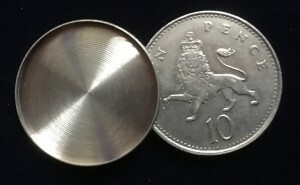 This shell fits over any ten pence coin from your or your audiences change which means no one will suspect you are using trick coins. It enables you to do many tricks that need an extra coin without the worry of concealing the extra coin. Almost any coin trick can be improved by using a shell coin to the routine. When you do coins across you can use it to have the last coin fly to the spectators hand and it makes tricks like coins through the table incredibly clean in handling. It will make any trick totally baffling to the spectator who does not know about the possibilities of using a shell coin. The trick on the video is done with a half dollar coin and a shell but it would work equally well with ten pence coin and shell, the type of glass is important use one like the one on the video. The trick was invented by my friend Kieran Miller.